Unstuck like Pilgrim – For the fainthearted . . . The temptation to regard the current mood of xenophobia, misogyny and chauvinism as a horrible time in history is swept aside by remembering by reports of the observance of today as Holocaust Memorial Day. Nevertheless, there is a wish just to be able to move to some other time; there is a wish to be like Billy Pilgrim. Billy Pilgrim, the anti-hero of Kurt Vonnegut’s satirical novel Slaughterhouse Five, experiences moments of coming “unstuck”, moving from one moment in his life to another in a random sequence, not knowing where or when the next “unstuck” phase might take him. The possibility of such movement seems not such a bad idea; if one could determine to which point in life one might travel, then the regular revisiting of special moments would become an option, one which might sustain one during the less happy times. If becoming “unstuck” was an option, then there is one time and place that, in the memory, remains perfect. Visiting Canada in 1998, a camper van holiday had been punctuated at the beginning and end by stays on a campground in the British Columbian town of Hope. On the outward journey, the mood had been upbeat, but by the time of the return, the reality of returning to an unhappy situation loomed like a dark cloud over a cartoon character. There is still clear recollection of a moment, sitting in the Husky Diner and eating soup and feeling the weight of depression bearing down. It seemed a moment that needed redeeming, the beauty of the countryside and the warmth of the people deserved memories worthy of the town’s name. Ten years later, we returned. 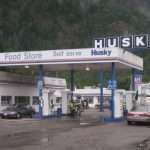 On a morning in July 2008, we parked our hired Chevrolet outside the Husky diner and went in for lunch. The children who had been seven and five in 1998 were now seventeen and fifteen and there was laughter and story-telling as we sat at the table watching the huge truck that passed. Indeed, it was real – a big country with big characters and a moment to treasure for however long the capacity to remember remained. In these days when the horrible looms large, to come unstuck and stand outside the diner in Hope seems a prospect infinitely attractive.